Though the venue for much of the 1908 Olympics, the White City Stadium, was demolished in 1985 in order to build the BBC White City buildings, the Mausoleum of its creator, Imre Kiralfy is still standing in Kensal Green Cemetery. An Austro-Hungarian showman and former conjurer who was a protégé of P.T. Barnum, Kiralfy was an unlikely person to mastermind the creation of the great stadium and it is perhaps understandable that the stadium was only added as an afterthought to a Franco-British trade exhibition on the same site. 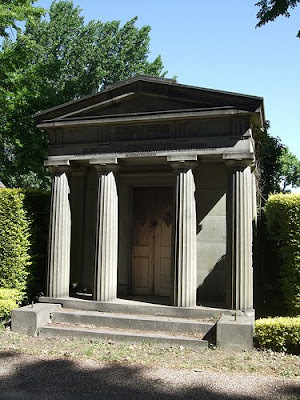 Upon his death, Kiralfy was interred in the Mausoleum, but in 1921 his wife had him removed and cremated, and another mausoleum built in New York, which was completed in 1924 and which became their final resting place. The cemetery is now open April - September, 9am - 6pm (10am - 6pm Sundays) and October - March, 9am - 5pm (10am - 5pm Sundays).